“Every rose has its thorn.” Poison. Low inventories of existing homes for sale on the market continued to be a thorn in the side for would-be buyers in December. 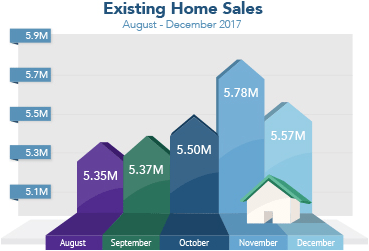 December Existing Home Sales fell 3.6 percent from November to an annual rate of 5.570 million units, below the 5.70 million expected, the National Association of REALTORS® reported. Declines were seen across the board in the Northeast, Midwest, South and West. From December 2016 to December 2017, sales were up 1.1 percent. Inventories of homes for sale on the market fell to a 3.2-month supply, well below the 6-month supply that is seen as normal. Housing inventories are down 10.3 percent from a year ago. Sales of new homes didn’t fare much better in December, due in part to unseasonably cold and harsh weather and fading sales in the South after people replaced houses soon after the September hurricanes. New Home Sales fell 9.3 percent in December from November to an annual rate of 625,000 units, the Commerce Department reported. This was below the 679,000 expected, and the largest monthly decline in nearly a year and a half. November sales were also revised lower, while December recorded losses in all four major sectors of the U.S.: the Northeast, South, Midwest and West. However, from December 2016 to December 2017, sales were up 14.1 percent. Economic growth eased in the fourth quarter of 2017, led lower by drags on trade and inventories. The first read on fourth-quarter Gross Domestic Product rose 2.6 percent, just below the 2.9 percent expected and down from 3.2 percent in the third quarter. Within the report, it showed that consumer spending surged 3.8 percent, which was the fastest pace in two years. The increase was fueled by purchases of new cars and trucks, clothing, and healthcare. Despite the slip in fourth quarter, GDP rose 2.3 percent for all of 2017, which was a nice improvement after the anemic 1.5 percent in 2016. Gross Domestic Product is the monetary value of all finished goods and services produced within a country’s borders in a specific time period. It is a key measure used to gauge the strength of our economy. Mortgage Bonds were able to stabilize in recent days after their sharp decline. Home loan rates remain attractive and near historic lows. The busy economic calendar features key news on inflation and the labor sector. Plus, the Fed meets. Reports kick off on Monday with Personal Income, Personal Spending and the inflation-reading Personal Consumption Expenditures. Consumer Confidence will be released on Tuesday, followed by Consumer Sentiment on Friday. Wednesday brings the ADP National Employment Report, Pending Home Sales and the Employment Cost Index. On Thursday, look for Initial Jobless Claims, Productivity and the ISM Index. Last but not least, on Friday the Jobs Report for January will be released. This includes Non-farm Payrolls, the Unemployment Rate and Average Hourly Earnings.